When it comes to Quinceanera party, Sweet 16 Limo Packages NYC is the perfect transportation option to consider. 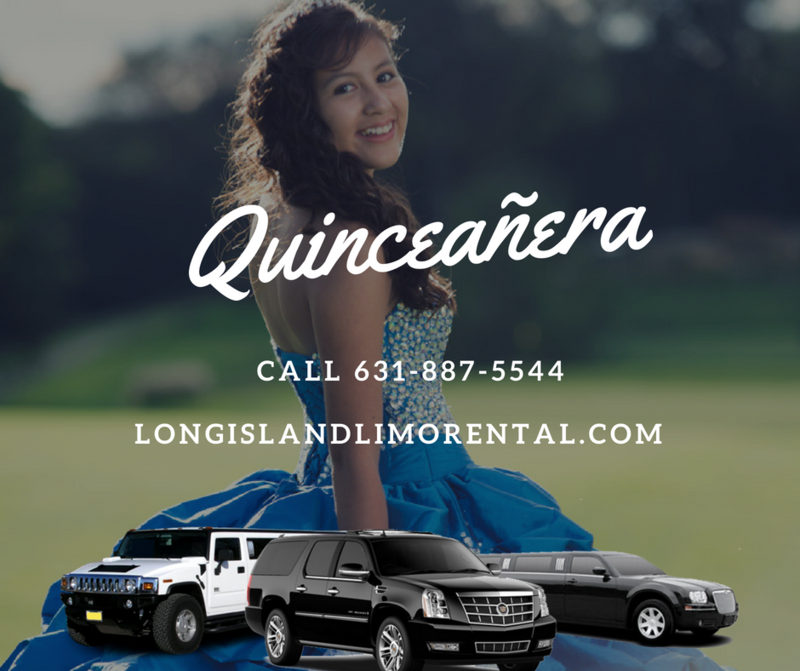 At Long Island Limo Rental, we offer an unforgettable Birthday Quinceañera limo service for your special party. With a wide range of exotic limos, you definitely will have a memorable birthday celebration. Our Stretch Limos, Party Buses, and SUV Limos are all available for your riding pleasure. Your friends will be pleasantly surprised and envious of you as you arrive in style and luxury at your Long Island Birthday event. Your 16th birthday is a special event and you can’t afford to celebrate it alone. You need to have your friends around you to enjoy the beautiful occasion together. Our Party Buses for Sweet 16 are luxurious with enough leg room to move around. You can invite up to fifty friends and family members to celebrate your special day with you and you can rest assured that our unique Quinceañera Sweet 16 Party Bus Package is large enough to accommodate every one of your guests. You can make your Birthday Quinceanera party your best event ever with some amazing party ideas. At Long Island Limo Rental, we offer our service to different event venues and exciting locations in the city. Wherever your birthday party is taking place, you can trust us to take you and your party guests to the venue without stress. We provide cheap Limos for Sweet 16 all the way from Long Island to NYC, to Nassau County and Brooklyn, and to Suffolk. All you have to do is let us know your party location and we will be there to provide the perfect limo for your special day. All our limos, party buses, and sprinter vans come with state of the art technology to make your ride with us pleasurable. If you have the special music that you want us to play for you, for instance, all our vehicles come with Bluetooth technology that will make the process seamless. You can plug your phone or any device to the Bluetooth device and enjoy your music with your guests as you travel to your party location. Our Sweet 16 Limo Packages near me is absolutely world class and will deliver the highest quality of service to you on your special day. There are amazing things you can do on your special Quinceanera birthday celebration. Right from the time we pick you and your party guests up, you can start having fun to the fullest. Some exciting party ideas you can explore while riding in the limo include games, dance competition, karaoke make-believe, and a host of other entertaining activities. You will love every moment of your ride with us. And if you want to bring along food, snacks and drinks, be sure that we allow it. However, we always request that you move them out when we drop you off at your location. Wherever you are, we will arrange the perfect Sweet 16 party bus near me that is close to your location and our chauffeur will be delighted to pick you up without issue. Call us today to make a reservation for your special limo service. Whatever Sweet 16 Party Bus ideas you have, you can be assured that we have the perfect ride to fit into your ideas. Our team members will be delighted to receive your inquiries and reservation.